S Shivaprakasha, K Radhakrishnan, A Gireesh, P Shamsul Karim. Routine Screening For ESBL Production, A Necessity Of Today. The Internet Journal of Microbiology. 2006 Volume 3 Number 1. Background: Extended spectrum beta lactamases (ESBL) are plasmid mediated enzymes capable of hydrolyzing broad spectrum cephalosporins and monobactams. ESBL producing organisms also show cross resistance to many other antibiotics, limiting therapeutic options. Aim: To study the frequency of ESBL producers among Enterobacteriaciae, their prevalence in the hospital and their susceptibility pattern to other antibiotics. Materials And Methods: Between July 2004 to Dec. 2004, a total of 1889 clinically significant Gram negative bacilli belonging to Enterobacteriaciae isolated from various clinical specimens were subjected to screening for ESBL production by standard techniques. Results: ESBL production was noted in 60.98% (n=1152/1889) of the isolates tested. Percentage of ESBL producers within a species was highest in Enterobacter species 70.9% (n=105/148) followed by Klebsiella species 67.4% (n=439/651) and E.coli 62.34% (n= 568/911). The most frequent ESBL producer was E.coli from ambulatory and ward samples, while from intensive care units it was Klebsiella species. Sensitivity of these isolates to Meropenem was 99.8%, piperacillin tazobactam 96.8%, cefoperazone sulbactam 93.3%. Conclusion: There is a high prevalence rate of ESBL producers among Enterobacteriaciae. E.coli and Klebsiella species pose a major concern among these. Routine detection of ESBL production in clinical laboratories gives valuable information to the clinician in appropriate selection of antibiotics. ESBL production was tested by using ceftazidime (30mcg) and ceftazidime plus clavulanic acid (30/10mcg) discs on Mueller-Hinton agar. Organism was considered as an ESBL producer if there was a ≥5mm increase in zone diameter around ceftazidime/clavulanic acid disc compared to zone around ceftazidime disc alone. ESBL production was tested in parallel with the antibiotic susceptibility testing on a separate Mueller Hinton agar plate. As per NCCLS guidelines, an isolate was reported as resistant to all penicillins, cephalosporins and aztreonam, if it was an ESBL producer. Klebsiella pneumoniae ATCC 700603 strain was used as ESBL producing control strain, E.coli ATCC 25922 was used as ESBL negative control strain. Sample source, patient location and other relevant details were noted. Sample source distribution of ESBL producers is shown in Table 1. The analysis was done by SPSS (Statistical Package for Social Sciences) version 11. Categorical variables were reported using frequencies and chi-square test was used to analyse the significance of different ESBL producers against the location in the hospital, p value <0.05 was considered significant. 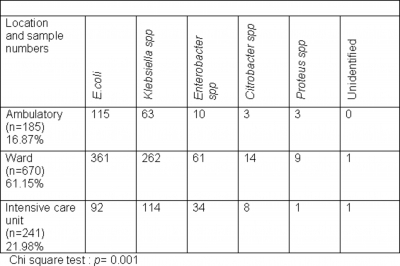 The most frequent Enterobacteriaciae isolated was E.coli (48.2%) followed by Klebsiella species (34.5%) and Enterobacter species (7.8%) [Table 2]. ESBL production was noted in 60.98% (n=1152/1889) of the isolates tested. Among the ESBL producers, urinary isolates were 535 and 617 isolates were from other samples. Percentage of ESBL producers within a species was highest in Enterobacter species 70.9% (n=105/148) followed by Klebsiella species 67.4% (n=439/651) and E.coli 62.3% (n= 568/911). Locationwise distribution of ESBL producers and predominant organism from different locations of the hospital was analysed. E.coli was the most frequent ESBL producer from ambulatory and from ward samples. Klebsiella species was the most frequent ESBL producer from intensive care unit samples [table 3]. Sensitivity to meropenem was 99.8% (n=1150/1152), piperacillin tazobactam 96.8% (n=1115/1152), cefoperazone sulbactam 93.3% (n=1075/1152), cotrimoxazole 21.7% (n=250/1152), ciprofloxacin 16.6% (n=191/1152), gentamicin 13.3% (153/1152), amikacin 53% (610/1152). Urinary isolates were tested against nitrofurantoin, norfloxacin, nalidixic acid. These showed susceptibility rate of 66.35% (n=355/535), 16.4% (n=88/535) and 12.3% (n=66/535) respectively [Table 4]. Our study shows that there is a significant difference in the type of organism isolated from different locations of the hospital (p=0.001). The highest number of ESBL producers were E.coli in ambulatory and ward samples, while from intensive care units it was Klebsiella species. This demonstrates that E.coli and Klebsiella species pose a major challenge in hospitalized patients during selection of empirical antibiotic therapy. It is an established fact that, ESBL producers show cross resistance to other antibiotics also, thus limiting the therapeutic choice. We have noted this in our study as well. Sensitivity to meropenem was almost absolute (99.8%). Sensitivity to piperacillin tazobactam (96.8%) and cefoperazone sulbactam (93.3%) was also good. Whereas sensitivity to gentamicin, ciprofloxacin, co-trimoxazole, nalidixic acid and norfloxacin was poor and not suitable for empirical selection. Urinary isolates showed >50% susceptibility to amikacin and nitrofurantoin. These are the alternative cheaper antibiotics which can be considered for empirical therapy. The routine susceptibility testing by clinical laboratories fail to detect ESBL positive strains and shows false invitro sensitivity to cephalosporins. (16) Screening for ESBL production as a routine procedure in clinical laboratories gives valuable information to the clinician in appropriate selection of antibiotics. Hence, we conclude based on our study that, there is a high prevalence rate of ESBL producers among Enterobacteriaciae. E.coli and Klebsiella species pose a major concern among these. Based on the prevalence rate of the ESBL producers in a healthcare facility, antibiotic policy of the institution can be tailored to achieve superior therapeutic outcome and bring about a reduction in healthcare costs. It also eliminates misuse of conventional cephalosporins in a significant proportion of patients. 1. Antimicrobial susceptibility testing. In:Elmer W Koneman, Stephen D Allen, William M Janda, Paul C Schreckenerger, Washington C Winn Jr., editors. Colour Atlas and text book of Diagnostic Microbiology. 5th edn. Philadelphia: Lippincott Williams & Wikins; 1997. pp. 785-856. 2. Jacoby GA, Sutton L. Properties of plasmids responsible for production of extended-spectrum B-lactamases. Antimicrob Agents Chemother 1991; 35: 164-69. 3. Nathisuwan S, Burgess DS, Lewis II JS. ESBLs: Epidemiology, Detection and Treatment. Pharmacotherapy 2001; 2: 920-28. 4. Jarlier V, Nicolas M, Fournier G, Philippon A. Extended broad-spectrum -lactamases conferring transferable resistance to newer -lactam agents in Enterobacteriaceae: hospital prevalence and susceptibility patterns. Rev Infect Dis 1988; 10: 867-78. 5. Livermore DM, Yuan M. Antibiotic resistance and production of extended spectrum b-lactamases amongst Klebsiella spp. from intensive care units in Europe. J Antimicrob Chemother 1996; 38: 409-24. 6. Bantar C, Famiglietti A, Goldberg M. Three-year surveillance study of nosocomial bacterial resistance in Argentina. The Antimicrobial Committee; and the National Surveillance Program (SIR) Participants Group. Int J Infect Dis 2000; 4: 85-90. 7. Zaman G, Karamat KA, Abbasi S, Rafi S, Ikram A. Prevalence of Extended-spectrum beta-lactamase (ESBL) producing Enterobacteriaciae in nosocomial isolates. PAFMJ 1999; 49: 91-6. 8. Performance standards for antimicrobial susceptibility testing. Fourteenth informational supplement M 100-S14. NCCLS 2004, Wayne, PA.
9. Louis B. Rice, Daniel Sahm, and Robert A. Bonomo. Mechanism of Resistance in Antibacterial agents. In: Patrick R Murray, Ellen Jo Baron, James H Jorgensen, Michael A Pfaller, Robert H Yolken editors. Manual of Clinical Microbiology. 8th edn. Washington DC:ASM press; 2003. pp. 1074-1101. 10. Hsueh PR, Chen ML, Sun CC, Pan HJ, Yang LS, Ho SW et al. Emergence of antimicrobial drug resistance of major pathogens causing nosocomial infections at a university hospital in Taiwan 1981-1999. Emerg Infect Dis 2002; 8: 63-8. 11. Singhal S, Mathur T, Khan S, Upadhyay DJ, Chug S, Gaind R etal. Evaluation of methods for Amp-C beta-lactamase in gram negative clinical isolates from tertiary care hospitals. Indian J Med Microbiol 2005; 23: 120-24. 12. Srujana Mohanty, Ritu Singhal, Seema Sood, Benu Dhawan, Bimal K. Das, Arti Kapil. Comparitive in vitro activity of beta-lactam/beta-lactamase inhibitor against gram negative bacteria. Indian J Med Res 2005; 122: 425-28. 13. Mathur P, Tatman A, Das B. Prevalence of extended beta lactamase producing gram negative bacteria in a tertiary care hospital. Indian J Med Res 2002;115: 153-57. 14. Babypadmini S, Appalaraju B. Extended spectrum -lactamases in urinary isolates of Escherichia coli and Klebsiella pneumoniae - prevalence and susceptibility pattern in a tertiary care hospital. Indian J Med Microbiol 2004; 22: 172-74. 15. Subha A, Ananthan S. Extended spectrum beta lactamase (ESBL) mediated resistance to third generation cephalosporins among Klebsiella pneumoniae in Chennai. Indian J Med Microbiol 2002; 20: 92-5. 16. Chaudhary U, Aggarwal R. Extended spectrum -lactamases (ESBL) - An emerging threat to clinical therapeutics. Indian J Med Microbiol 2004; 22: 75-80.